A groundbreaking ceremony for Jakarta’s first metro line was held at Dukuh Atas on October 10 2013, led by Jakarta Governor Joko Widodo. ‘After 24 years of dreaming to have an MRT, some may even have forgotten it. Finally the dreams of Jakarta residents will come true’, said Widodo. The first phase will see construction of a 15·7 km metro line connecting Lebak Bulus in the south with the Hotel Indonesia traffic circle. There will be 13 stations, of which six will be underground. Design capacity is 173 000 passengers/day. Construction is divided into eight works packages: three underground civil works, three elevated civil works, E&M systems and rolling stock. Two of the underground works packages will be carried out by a consortium of Shimizu, Obayashi, Wijaya Karya and Jaya Konstruksi; the other was awarded to Sumitomo Mitsui Construction Company and PT Hutama Karya. Two of the elevated civil works packages will be carried out by a Tokyu-WIKA consortium. These cover the Lebak Bulus – Fatmawati and Blok M – Al-Azhar sections, and are worth ¥15bn and ¥10bn, respectively. A consortium of Obayashi, Shimizu and Jaya Konstruksi has been awarded a ¥10bn contract for the Patung Pemuda – Senayan section. Both consortia will be given four to six months to present their designs, and the total contract length is 243 weeks. The first phase is planned to be completed by the end of 2017, with the start of operations scheduled for early 2018. Construction will require 3·6tr rupiah, part of which will come from a ¥125bn soft loan from the Japan International Co-operation Agency. The central government will repay 49% of the loan and the city administration will repay 51% over 40 years, following a 10-year grace period. The interest rate will be less than 1% per year. The second phase, an 8·1 km northern extension, is planned to follow. This is a milestone for Jakarta and Indonesia. A country with over 230 million people, and Jakarta with its 10 million people do not have a Metro system. There have been many attempts to improve the traffic in Jakarta and Bandung. But nothing have been done, until now. 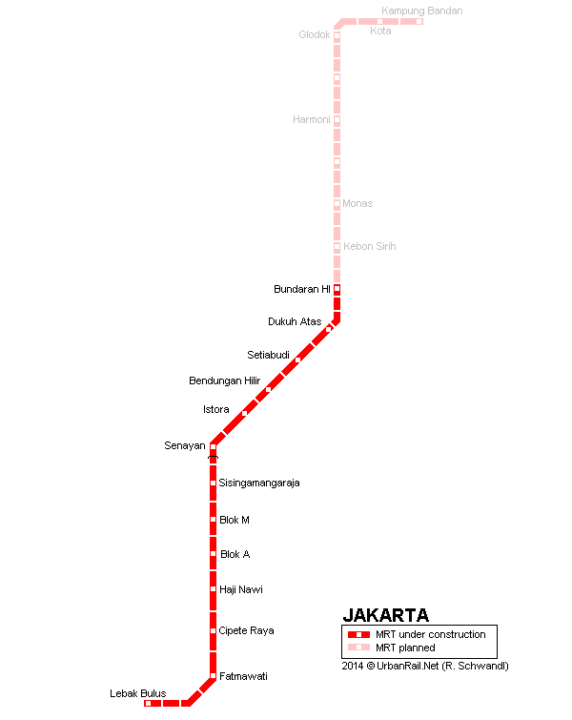 Line 1 is planned to be extended 8 km northwards to Kampung Bandan, Kota in North Jakarta by 2020. An 87 km long east-west Line 2 is planned to built in the future after 2020. A commuter airport line from Manggari station to Jakarta Aiport is currently under feasibility study. The 14 km, 12 station Blue monorail line running from Kampung Melayu, East Jakarta to Taman Anggrek in West Jakarta is planned to be completed once the Green line is operational. So what with Brazil after World Cup! ?